This image was drawn so many years ago and finally a crop circle event and unsolicited messages give it a meaning for me. So i am saying THANKS TO ALL!!! 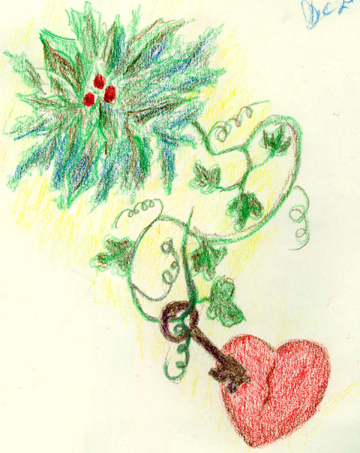 What I gleaned about the meaning of the above image that I drew long ago is that it is a description of the purpose of the labyrinth of experiences (the vine) and the clusters of tasks and trials (leaves with berries, i.e. seeds) in our lives. That purpose is to open the heart consciousness of our being. What that means in itself is quite a mystery, but the image tells us that there is more to life than what it seems and that the heart element is the goal and fulfillment of living. In the last crop circle posted by Robert, I sensed another type of communication going on between Robert, who seems to know when, where and often how formations will appear in farmers' fields in Holland and those who cause the crop circles. The formations he reports have a different quality than those appearing in Great Britain and other places. They seem to be personally coded–as if there is a direct link between Robert and the Circle Makers–and that somehow Robert is gifted with a new type of consciousness that is able to contact unknown forces and to know about unforeseen events. The Netherlands formations have a direct, pure, clean and personal character about them. Is this communication ability of Robert's an illustration of the consciousness of the heart? The very great and elaborate circles as are found in Britain require more of an intellectual inquisitive approach. They seem to be meant to address those of us who are deeply entrenched in worldly traditions and knowledge so that through that appeal, we may come to some new way of looking at things. Nancy Talbott, researcher and advisor to Robert, has reported on the page for the last 'figure of eight' formation, that this time Robert felt a 'message' in the traditional sense that could be passed on to others. The message had to do with thankfulness to those of us on Earth who are paying attention to the crop circles. It went further and indicated that those who are attempting to access the crop circle information in earnest are making history. That is so encouraging since many times when I write about symbols in the crop formations, I feel completely alone and a bit crazy. So this appearance and message is very comforting and confidence-bulding. Another old image of mine and the new figure eight formation seem to complement one another and perhaps render an insight into what the 'NEW" way of being is. You can view formations that Robert has 'seen' since 2007. Nancy Talbott's research website has very interesting information.